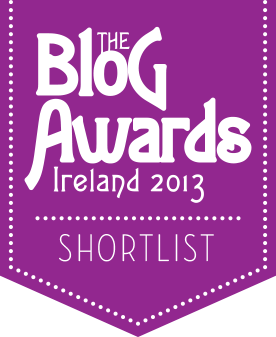 Exciting news was waiting for me on Twitter when I woke up yesterday: having been kindly nominated in several different categories for The Blog Awards Ireland 2013, I was chuffed to learn that Lexicolatry has been shortlisted in three categories: Science & Education, Art & Culture and Humour. Also, my post 'Biro: Balls Well That Pens Well' was nominated in the 'Best Post' category. This is down to a public vote; each person can vote once a week and if you so wish you can vote by clicking here and selecting Lexicolatry. I've been having a look at some of the other shortlisted blogs, and it's an honour to be in such esteemed blogging company, so congratulations to all that made it through to the shortlist. Judging is now underway to determine the finalists, and the winners will be announced at the Blog Awards themselves on the 12th October. I'm very excited at the prospect of meeting some of my fellow bloggers, so I've already booked my ticket to attend. Of course, if you'd like to come, there's still time to book tickets and it'd be great to meet anyone that wants to come along. I can never say it enough - but thank you all so much for reading Lexicolatry, for your fun and witty comments, to contributors like Katie Dwyer (who has written today's word which you can see by clicking here) and of course to all those that took the time to nominate Lexicolatry in the first place. CONGRATS, EDDIE! This is such great news, and so well deserved. Now bring us new words! Obscure?? Are you avin' a giraffe? There ain't a mucker in the world that don't get well proper English like 'chuffed'. Obscure! Would you ever Adam n' Eve it? Cheers, C - your (witty) (bizarre) comments are a big part of the fun. Oh gosh Ed, that is wonderful! I can't see where to vote. The link you gave goes to the long list, and try as I might, I can't find where to vote for the short list for the Best Post. And the brain's in go-to-bed mode! I checked the link and it's the right page, although it is confusingly marked long-list. However, it's the long-list for the 'Best Post' category. If you have a look down there, you will see Lexicolatry; just tick the box, go to the bottom and press vote. Why congratulations, Ed. That's great news! Well done. You have my vote. I've just voted. When do I get my official followers membership pack, including a signed OED and lock of your hair?